- After gaining entrance to the back room of Moonbucks you’ll find a teleporter that leads to, well, what appears to be a very different side of the coffee shop. Make sure everyone’s healed up, as you’ll face baddies here. They’re not much more difficult than what you faced on Mount Pom-Pom, and some of what you face (Java Beans and Java Beanhemoths) will be weak to fire, so the Baker’s a good choice for this area. The Conspiracy Guy’s also good for taking down Decaffitators thanks to his electrical attacks. Note that the Java Beans will transform into Java Beanhemoths after a single turn and replenish their health, so unless you plan on taking ‘em down in a single round, you might as well ignore ‘em. - The path splits to the north, though both directions ultimately take you to the same place. Take both paths for completeness’ sake, as the eastern path will walk you past a present containing $150, while the west leads to a present containing a Coffee. A teleporter waits in the north. - You’ll find a three-way intersection beyond the teleporter. Start by taking a left, then following the path north. Look for a present in the far north that contains Bowling Shoes for Brother, then head east. Past a rather confused Decaffitator, who will fight and dispense Coffee as many times as you like, you’ll find another junction. Check the large, obvious machine here for some experience, then continue east. This path eventually bends back to the teleporter - though along the way you’ll find a present bearing Coffee. - You’ll also find a southbound path on the right side of the junction. Head south, and follow the path until you arrive at a teleporter. Continue west and south from here to find a present containing Bread at a dead end, then backtrack and hop onto the teleporter. - The path splits again in the next room. The left path leads to a dead end and naught else, so you’re safe to ignore it and head north. This leads to - surprise! - another split, and, once again, the side path (right this time) is a dead end… though at the end of this one, at least, you’ll find a Crossword Puzzle for Mom. You can also find a Donut in the south of this branching path, though you need to bypass a bunch of enemies to reach it. - At the end of the northern path is a wider platform. 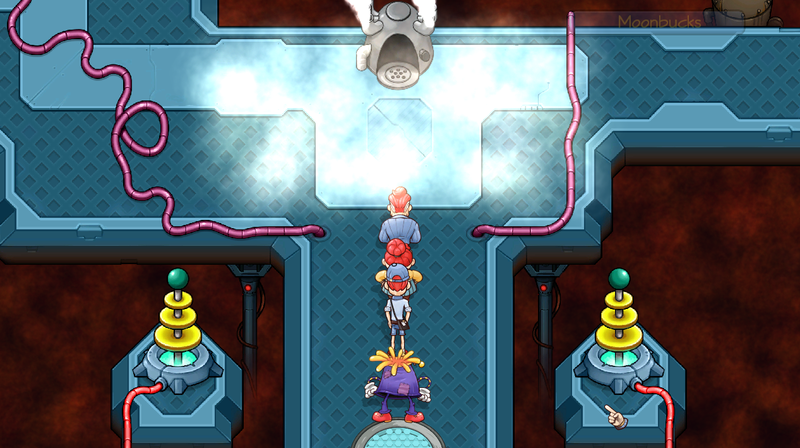 Heal up before reaching the platform, as it opens onto a cut scene - and a boss battle. The VP battles Mr. Mocha, overlord of Moonbucks. Hrm. 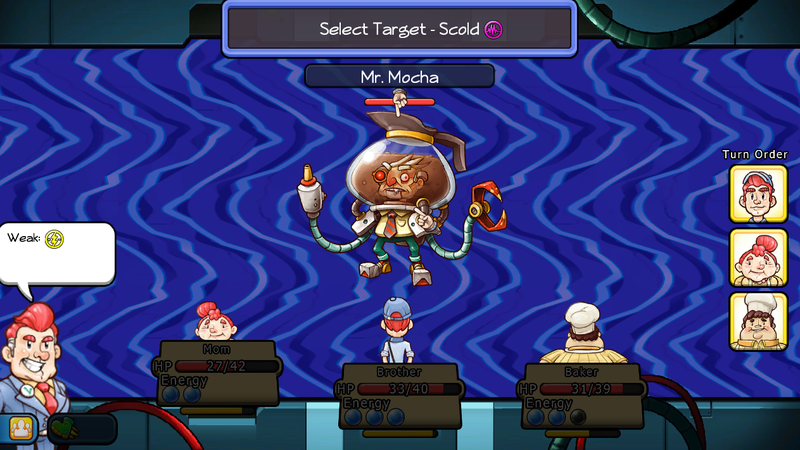 A weird man-coffee hybrid, Mr. Mocha is quite durable, but he isn’t that strong. He’ll spend the majority of the battle upping his speed, and will only occasionally splash coffee on your team to inflict moderate amounts of physical damage. Dangerous, but not that dangerous. Commit one member of your party to healing as necessary while the other two smack Mr. Mocha around with either physical attacks or electricity (assuming you brought Conspiracy Guy along, that is). Mr. Mocha will probably take a while, but his vulnerability to status ailments and aggroing make him pretty easy to defeat. Mr. Mocha will drop a Travel Mug for the Barista when defeated. - A bunch of stuff will happen after you beat Mr. Mocha, ending in the, uh, blast-off of Moonbucks. This will bring Chapter I to an end, trigger Chapter II, unlock Officers as enemies on the streets of Home Town, and allow you to recruit the Cop (though you need to defeat a slew of Officers before she’ll join ranks). Once you’re done poking around Home Town, hop into the cab near the VP’s House to head to your next destination: Capital City.